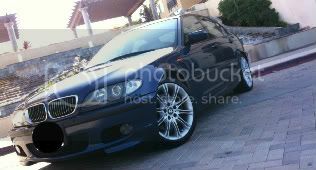 FS in Southern CA: 2004 330i ZHP - Imola/alcantara, AT. Thread: FS in Southern CA: 2004 330i ZHP - Imola/alcantara, AT. Saw this on Craigslist, thought someone might be interested. It looks like a clean one, and seems reasonably priced. This one looks REALLY sharp. Good find. I personally looked at this ZHP on Friday. Engine wise, it’s beautiful. Babied and clean. No leaks, smells, spills, nothing. Runs super strong and shifts smooth. Rides great and everything works very well. Cosmetically needs work on the front bumper, can be seen in the picture the gray at the bottom left which runs along the whole front side and the grills would need replacing, perfect chance to get some matte black ones. Missing left fog lamp also. Interior has the dynavin Android nav, not the OEM, but is missing the nav disc so nav doesn’t work right. The front pillar adhesive on both sides are peeling, probably an easy fix with some new adhesive right? Seats are in great condition considering the age of the car. Only real thing that needs replacing is the back ashtray storage compartment but that’s about it. All in all, seems like a heathy and great car. I’m seriously considering it for myself but not sure about the price for some of the cosmetic work. I know a body shop that would take care of the front bumper for $300. But prices will be higher in California. GL on your decision. I believe you could fix the cosmetic stuff one step at a time, those are not urgent issues. Those all seem like straightforward fixes. GL w ur decision. Not to hijack this tread but where did you get new A-pillar covers? Mine are ripe for replacement as well. Sorry, meant to quote this: where did you buy the A-pillar covers? I personally looked at this ZHP on Friday. ... All in all, seems like a heathy and great car. I’m seriously considering it for myself but not sure about the price for some of the cosmetic work. Seems like a solid car from your description. There's a body shop on the corner of Euclid and 405 NB on/off ramp that has a huge banner that says bumper repaint for $300 or $350 if I remember correctly. What about your current zhp, or will you just have 2?